As weather gets colder, there’s nothing quite like sitting by a crackling fireplace with a mug of hot chocolate in hand. A wood burning fireplace serves as an area for a family to congregate and enjoy relaxing quality time together. This space becomes even more special around the holidays. In order to create this picture perfect moment, there are some steps that need to be taken to prepare your fireplace and chimney for winter. Chimneys are responsible for 42% of home heating fires. You can prevent dangers to your family by properly preparing your fireplace for cold weather. Controlled Aire can help you with all the necessary preparation to ensure your fireplace will work properly without endangering your home. Let us help you make your home cozy and holiday ready today! Fireplace cleaning and chimney inspection are necessities to keep your home and family safe. As you use your fireplace, debris and harmful substances such as creosote will buildup in the chimney. This debris clogs the chimney causing the fireplace to function improperly and can put your home at risk for a fire. Controlled Aire provides a wide variety of fireplace repairs and services to keep your fireplace in it’s best condition as temperatures plummet. 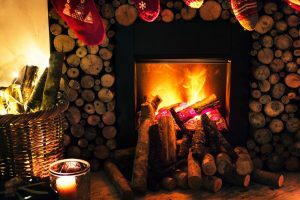 Heat your home and put your mind at ease this holiday season by following our steps to properly winterize your fireplace. If you use your fireplace regularly, you should already have a fireplace cover. Fireplace covers and doors prevent sparks and logs from tumbling out of the fire. They are a proper safety measure that should be used whenever a fire is burning. They will make your home safer in addition to increasing energy efficiency. The heat will make its way through the cover to heat your home, but cold winds from outside will be stopped by the glass, locking in the heat nad keeping out the cold. The National Fireplace Protection Association suggests that wood burning fireplaces be cleaned once a year in order to keep them functioning properly. Controlled Aire provides cleaning services that will keep your fireplace up to regulation standards. We will remove buildup from dust and debris. While we are sweeping your chimney, we will also inspect its current condition. If there are any cracks, loose bricks, or signs of deterioration, we will notify you immediately and develop a plan to fix the problem in a timely manner. While a chimney cap should be on your chimney year round, it is a particularly important step in the winterization process. This mesh cover keeps animals and debris such as branches out of your chimney. An animal might see the chimney as a great place to nest and get out of the wind when temperatures get colder. Additionally, winter snow storms makes trees susceptible to breakage and debris could easily end up in your chimney. A chimney cap will keep these pests out and aid in keeping your chimney clean this winter. 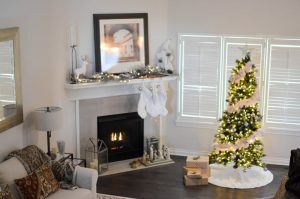 What about a gas fireplace or electric fireplace? Gas and electric fireplaces require less maintenance when it comes to winter preparation because they lack a chimney. However, there are components to these types of fireplaces that should be checked on a regular basis to ensure they are running properly. These are a few quick checks you can do on your own to keep your gas or electric fireplace in great shape. Check these elements on your gas fireplace monthly to make sure it is running properly. Check these components on your electric fireplace regularly to keep it in its best condition. Contact our team at Controlled Aire and start getting your fireplace ready for winter today!